FairWinds Antique Maps - Item # RS2149: La parte Occidentale della Nuova Francia o Canada. La parte Occidentale della Nuova Francia o Canada. 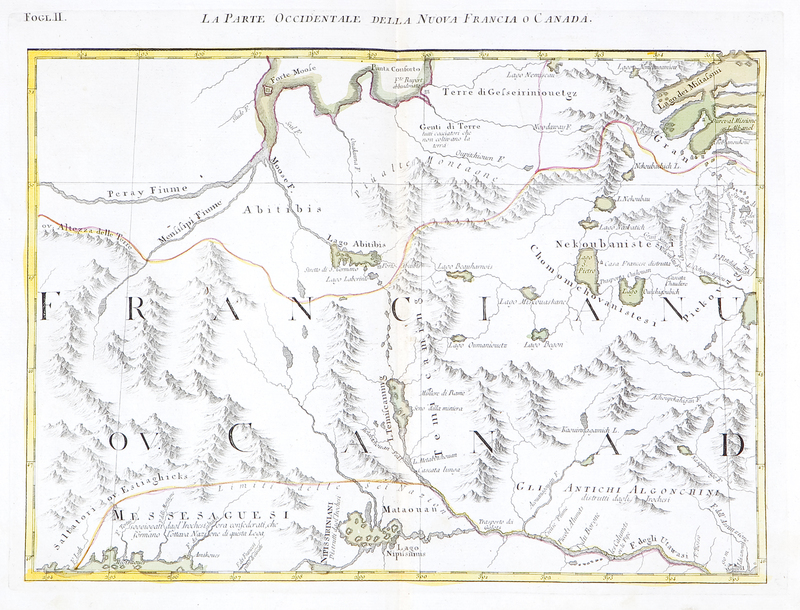 The highly detailed map of western New France, or the region between James Bay, Lake Mistassini (Lac Mistassine), Lake Huron and, in the lower right corner, "Monreal," from Zatta's 1778 12-sheet version of Mitchell's landmark map of North America. Includes many place names, roads, notes on native tribes, and a clearly delineated boundary of the Six Nations territory. Size: 17 1/2" x 13 1/2"